This morning, I went grocery shopping with my son and took my digital camera along to record the experience of grocery shopping with a penny-pincher. Let’s see how it went – maybe we’ll both learn something. Welcome to Hy Vee! I went shopping at the Hy-Vee grocery store in Ankeny, Iowa, a northern suburb of Des Moines. 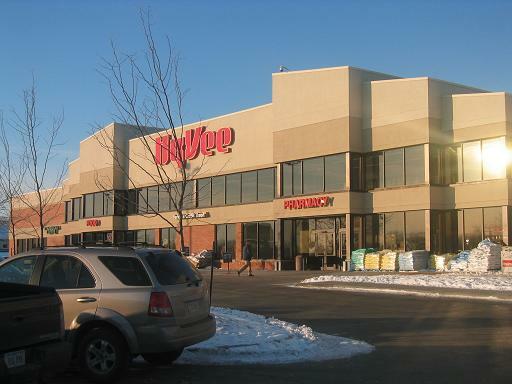 Hy-Vee is a midwestern grocery chain that is almost ubiquitous in Iowa. There are many, many Hy-Vees in the greater Des Moines area; I like this one because it’s fairly new, very clean, and the prices are competitive right now due to a new Fareway that opened up about two blocks away. Generally, stores where a new competitor is opening nearby are a good place to shop because they trim their prices quite a bit so that when people inevitably try the new place, they’ll remember the lower prices at the other, more familiar store. On grocery lists I prepare a grocery list before I leave the house. 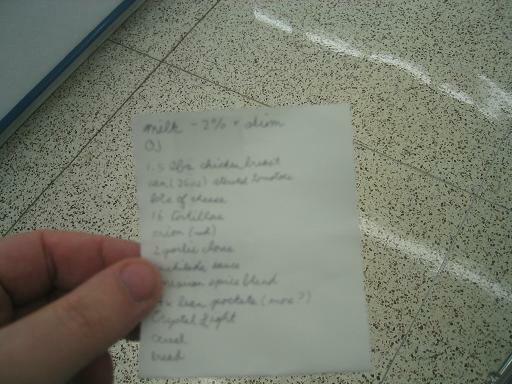 In this case, the list roughly matches the route I’ll take through the store, except for two items that I’m unsure about (I guessed where they were on the list). I usually head to the farthest point from the checkouts immediately and then work towards the checkout. Since the milk is in the back of the store, I head there first. On comparing generics to name brands The first purchase I want to look at is Crystal Light, which is what my wife and I used to replace soda in our diet. It’s healthier and cheaper for us. I need to buy a variety of flavors, though, so we have enough to last a while and don’t get sick of the same flavor. 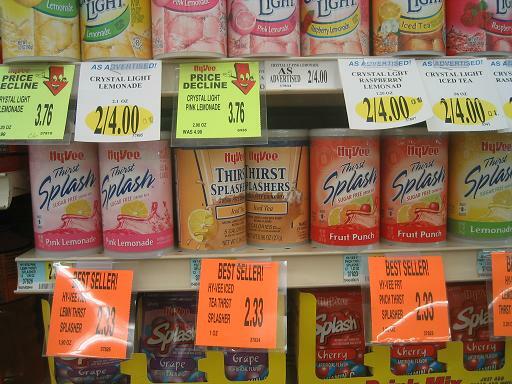 Quite often, we will buy the store brand of Crystal Light, Hy-Vee Thirst Splashers, because most of the time it’s a lot cheaper per quart. Today, however, the eight quart containers of Crystal Light are on sale! The Crystal Light containers are $2 a pop, while the Thirst Splashers are $2.33 a pop. 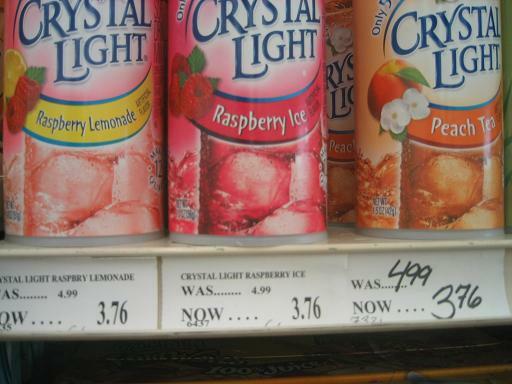 Clearly, the eight quart Crystal Light is a better deal here (and the flavors are better, too). But what about a size comparison? The larger twelve quart size of Crystal Light is almost double the price of the eight ounce size. Clearly the eight ounce name brand is the best choice here, so I stock up on them, particularly on the flavors that we don’t usually buy because they’re not available in the generic brand. On size comparisons I used to be of the belief that the larger size was always cheaper per ounce, but in fact this is not true on a pretty regular basis. Here, I’m shopping for Life cereal (my favorite cereal which I eat for breakfast multiple times a week). 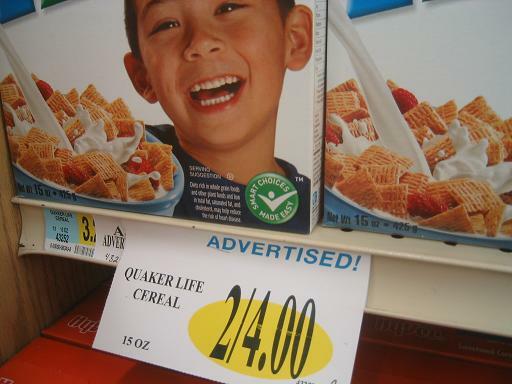 Here, you can clearly see that the 21 ounce box of Life cereal costs $3.88. I happen to have a coupon for fifty cents off, but I’ve bought Life pretty often, and I know even without calculating that it’s pretty high per ounce, even with the coupon, so I keep walking. Not much further down, things get better for me and my Life cereal. Here is a 15 ounce box for $2.00. With my coupon, that makes it only $1.50 for a box. I pounce and toss a box in my cart, even though I find the child on the box somehow vaguely disconcerting. My wife, on the other hand, insists on Special K cereal. Here, I have a 12 ounce box of Special K for $3.66. That comes out to $0.305 per ounce. 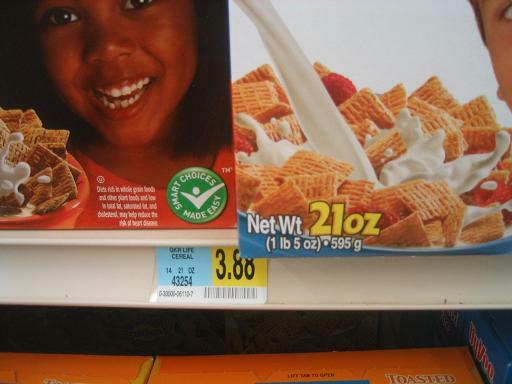 However, I also have a coupon for 50 cents off a box of Special K. With that coupon, it’s $0.263 per ounce. Is that better than the larger size? Right next to the first Special K box, we have a 16.7 ounce box of Special K for $4.98. 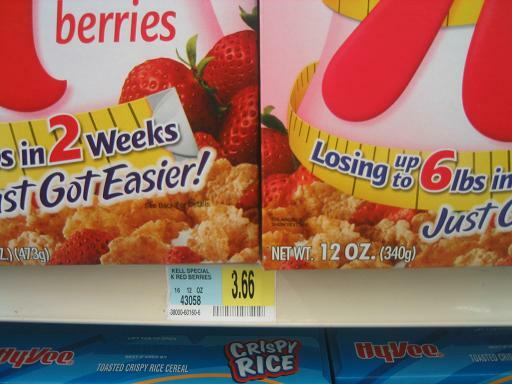 That makes it $0.2982 per ounce, cheaper than the smaller box. With the coupon, though, it’s $0.2683 per ounce, which is more expensive per ounce than the smaller box. So which do I choose? 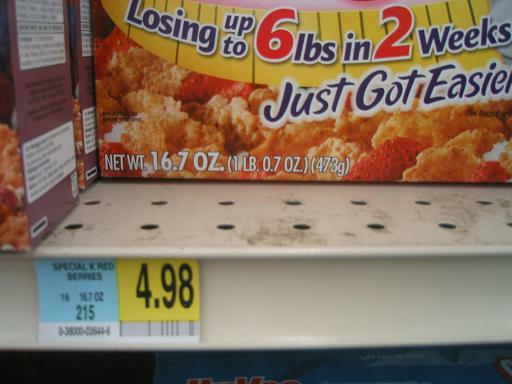 I go with the absolute cheapest rate I can get per ounce, which happens to be the smaller box with the coupon. If I didn’t have the coupon with me, it would have been the larger box. In short, a pocket calculator can be really really useful at the grocery store. I usually make several such calculations on a shopping trip, ones that are close enough that I can’t quickly determine with just a glance which is the best deal. 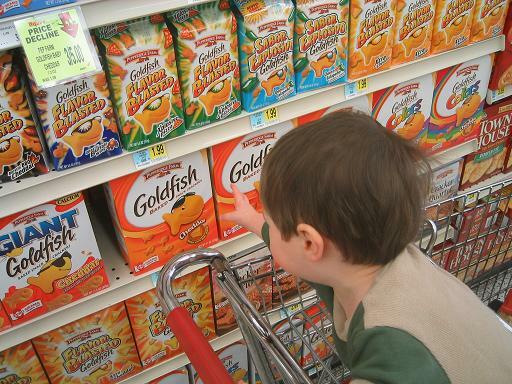 On shopping with children Near the end of the trip, I was walking down an aisle toward the checkout when my son spotted his favorite snack in the whole world: goldfish crackers. He nearly dove out of the cart reaching for them. He doesn’t eat them at a very high rate, though, so the big packages get stale before he gets through them. Thus, we buy small packages of them. We also buy him the whole grain kind because it’s better for his digestive system. Of course, the problem is that he wants something that’s not necessarily a need. Although he’s young enough now that he doesn’t realize that there is a cost for these items, I do want to teach him that just because he wants something, he doesn’t always get it, either. This happens to be about the twentieth thing he’s almost dove out of the cart for, though, and when I’ve walked away from other things, he has been perfectly fine with it. He also happens to be nearly out of goldfish crackers; we have a plastic goldfish container in his diaper bag, which I checked and saw that it was empty. 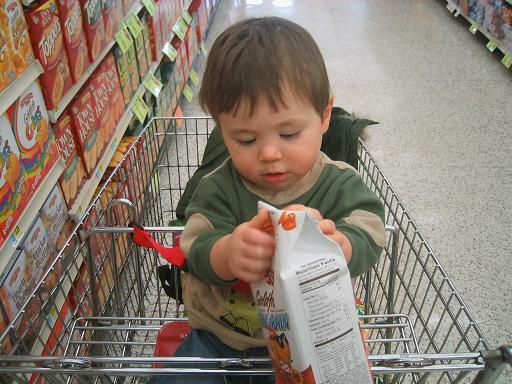 After picking up the goldfish, he’s distracted for the rest of the shopping trip just by playing with the bag. Was it a good choice? He was out of crackers, after all, but I still felt like I bought him something he didn’t need. I suppose, though, if my biggest guilt during a shopping trip is buying a bag of whole grain goldfish crackers that cost less than two dollars for my son when he’s out of crackers … well, I must be doing something right. Hopefully, you learned something from this trip. Let me know if you enjoyed it, or if you have any ideas for future photo diaries.